Take peace wherever you can find it. Peggy’s porch is everything I have everything I have ever dreamed of. 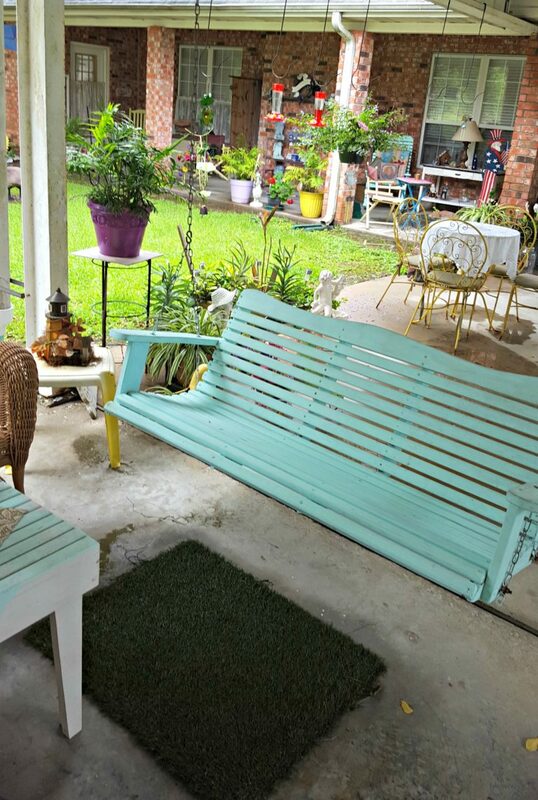 There are rockers and comfy chairs, and my favorite, a porch swing painted a fun color. There are throw rugs and side tables and flowers and painting and it just SCREAMS of comfort and love. It’s the perfect place to find peace, right on the porch. It’s where we gathered when my my Step-Mama, Debbie, died. We sat on that porch and talked, cried and yes, even laughed because that’s what is involved with comforting after death. Nobody does grieving like southern women. They gather together with pimento cheese sandwiches, banana pudding and sweet tea, while carrying with them the promise of hope as men sip from high ball glasses not even pretending it was tea. It’s enveloping, the comforting they bring. Peggy’s porch held all the love that could surround us, and it even spilled over the sides. People would come and go, but there was always someone there for a hug, and a chat. Even when the heavens opened up and the thunder boomed, we sat safe under the porch watching the torrential rain and somehow, receiving comfort from it as well. We were grieving a life lost far too soon, and the heavens agreed with us. When the sticky southern heat rose, someone would start the swamp cooler and the fans and we’d just sit and glisten (no true southern woman sweats, at leasts not women of a certain age) as we visited. Visiting seems different on a porch. Silence isn’t seen as rude but contemplative. It’s fine to just stare out into the outside, thinking about things. I was a stranger there, not known to most of the people on the porch. But as it the way of our south, I was my Daddy’s daughter and therefore, Debbie’s, too, so I was family. I was hugged and loved and immediately received a whole bunch of new Aunts and Uncles and cousins. I hadn’t been in back to Texas for 24 years, but being on that porch made me feel like I had never left. I have a front porch. It’s one of the things I insisted on when we were house hunting. I’ve been struggling a bit lately with being sad and just not okay, and I knew what I had to do to help me start feeling better. I headed to the porch. I dusted off the cushions and hung the wind chimes. I don’t have a fabulous porch swing like Peggy’s, but I have a glider and that will work. I have a big fan and lots of candles and fake flowers because I have a black thumb and kill the real ones. But they are cheery and happy and there are even garden gnomes and buzzing hummingbirds that flitter around. What’s been missing is friends, because I’ve been cutting myself off from people. I’m ready to work on feeling better, so I’ll be having porch time every day. I won’t invite people, because porch time is just people dropping in and visiting a spell. It’s no commitments but an open invitation and even 10 minutes of porch time is something. My porch is a work in progress, just like me.